The basic idea of a map is that it maintains key-value associations (pairs) so you can look up a value using a key. In this tutorial, we will discuss Java HashMap/Hashtable, LinkedHashMap, and TreeMap. HashMap has implementation based on a hash table. (Use this class instead of Hashtable which is legacy class) .The HashMap gives you an unsorted, unordered Map. When you need a Map and you don't care about the order (when you iterate through it), then HashMap is the right choice. Keys of HashMap is like Set means no duplicates allowed and unordered while values can be any object even null or duplicate is also allowed. HashMap is very much similar to Hashtable only difference is Hashtable has all method synchronized for thread safety while HashMap has non-synchronized methods for better performance. 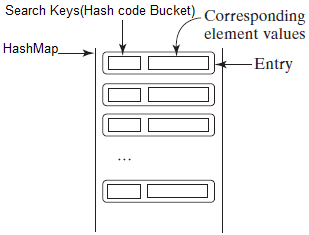 We can visualize HashMap as below diagram where we have keys as per hash-code and corresponding values. HashMap provides constant-time performance for inserting and locating pairs. Performance can be adjusted via constructors that allow you to set the capacity and load factor of the hash table. This is used to create HashMap based on existing map implementation m.
This is used to initialize HashMap with capacity and default load factor. This is used to initialize HashMap with capacity and custom load factor. The basic operations of HashMap (put, get, containsKey, containsValue, size, and is Empty) behave exactly like their counterparts in Hashtable. HashMap has toString( ) method overridden to print the key-value pairs easily. The following program illustrates HashMap. It maps names to salary. Notice how a set-view is obtained and used. LinkedHashMap extends HashMap. It maintains a linked list of the entries in the map, in the order in which they were inserted. This allows insertion-order iteration over the map. That is,when iterating through a collection-view of a LinkedHashMap, the elements will be returned in the order in which they were inserted. Also if one inserts the key again into the LinkedHashMap the original orders are retained. This allows insertion-order iteration over the map. That is, when iterating a LinkedHashMap, the elements will be returned in the order in which they were inserted. You can also create a LinkedHashMap that returns its elements in the order in which they were last accessed. This constructor constructs an empty insertion-ordered LinkedHashMap instance with the default initial capacity (16) and load factor (0.75). This constructor constructs an empty LinkedHashMap with the specified initial capacity. This constructor constructs an empty LinkedHashMapwith the specified initial capacity and load factor. This constructor constructs an insertion-ordered Linked HashMap with the same mappings as the specified Map. This constructor constructs an empty LinkedHashMap instance with the specified initial capacity, load factor and ordering mode. Removes all mappings from the map. A TreeMap is a Map that maintains its entries in ascending order, sorted according to the keys' natural ordering, or according to a Comparator provided at the time of the TreeMap constructor argument.The TreeMap class is efficient for traversing the keys in a sorted order. The keys can be sorted using the Comparable interface or the Comparator interface. SortedMap is a subinterface of Map, which guarantees that the entries in the map are sorted. Additionally, it provides the methods firstKey() and lastKey() for returning the first and last keys in the map, and headMap(toKey) and tailMap(fromKey) for returning a portion of the map whose keys are less than toKey and greater than or equal to fromKey. This is used to create TreeMap based on existing map implementation m.
This is used to create TreeMap with ordering based on comparator output. Java Program which explains some important methods of the tree map. HashMap allows one null key but Hashtable does not allow any null keys. Values in HashMap can be null or duplicate but keys have to be unique. Iteration order is not constant in the case of HashMap. When we need to maintain insertion order while iterating we should use LinkedHashMap. LinkedHashMap provides all the methods same as HashMap. LinkedHashMap is not threaded safe. TreeMap has faster iteration speed compare to other map implementation. TreeMap is sorted order collection either natural ordering or custom ordering as per comparator.